Now, a science team at the Department of Energy's Lawrence Berkeley National Laboratory (Berkeley Lab) has precisely measured some previously obscured properties of moly sulfide, a 2-D semiconducting material also known as molybdenum disulfide or MoS2. The team also revealed a powerful tuning mechanism and an interrelationship between its electronic and optical, or light-related, properties. To best incorporate such monolayer materials into electronic devices, engineers want to know the "band gap," which is the minimum energy level it takes to jolt electrons away from the atoms they are coupled to, so that they flow freely through the material as electric current flows through a copper wire. Supplying sufficient energy to the electrons by absorbing light, for example, converts the material into an electrically conducting state. As reported in the Aug. 25 issue of Physical Review Letters, researchers measured the band gap for a monolayer of moly sulfide, which has proved difficult to accurately predict theoretically, and found it to be about 30 percent higher than expected based on previous experiments. They also quantified how the band gap changes with electron density – a phenomenon known as "band gap renormalization." "The most critical significance of this work was in finding the band gap," said Kaiyuan Yao, a graduate student researcher at Berkeley Lab and the University of California, Berkeley, who served as the lead author of the research paper. "That provides very important guidance to all of the optoelectronic device engineers. They need to know what the band gap is" in orderly to properly connect the 2-D material with other materials and components in a device, Yao said. Obtaining the direct band gap measurement is challenged by the so-called "exciton effect" in 2-D materials that is produced by a strong pairing between electrons and electron "holes" ¬- vacant positions around an atom where an electron can exist. The strength of this effect can mask measurements of the band gap. 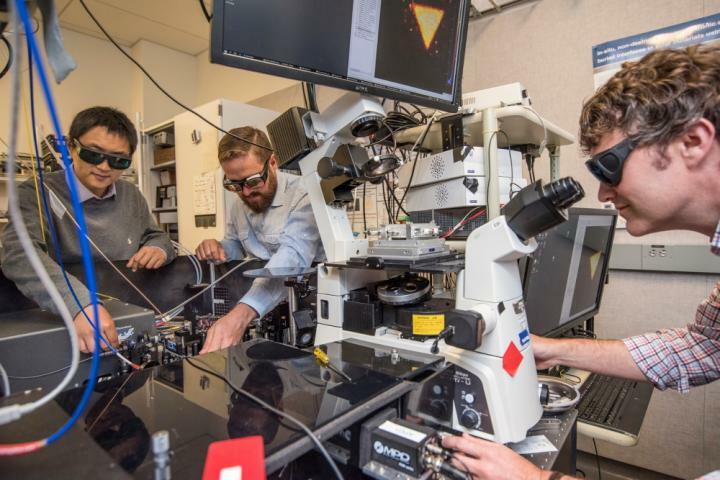 Nicholas Borys, a project scientist at Berkeley Lab's Molecular Foundry who also participated in the study, said the study also resolves how to tune optical and electronic properties in a 2-D material. "The real power of our technique, and an important milestone for the physics community, is to discern between these optical and electronic properties," Borys said. Researchers noticed a slight "bump" in their measurements that they realized was a direct measurement of the band gap, and through a slew of other experiments used their discovery to study how the band gap was readily tunable by simply adjusting the density of electrons in the material. "The large degree of tunability really opens people's eyes," said P. James Schuck, who was director of the Imaging and Manipulation of Nanostructures facility at the Molecular Foundry during this study. "And because we could see both the band gap's edge and the excitons simultaneously, we could understand each independently and also understand the relationship between them," said Schuck, now at Columbia University. "It turns out all of these properties are dependent on one another." Moly sulfide, Schuck also noted, is "extremely sensitive to its local environment," which makes it a prime candidate for use in a range of sensors. Because it is highly sensitive to both optical and electronic effects, it could translate incoming light into electronic signals and vice versa. Schuck said the team hopes to use a suite of techniques at the Molecular Foundry to create other types of monolayer materials and samples of stacked 2-D layers, and to obtain definitive band gap measurements for these, too. "It turns out no one yet knows the band gaps for some of these other materials," he said. Borys added, "We certainly hope this work seeds further studies on other 2-D semiconductor systems."